Originally used by vets to inhibit protein breakdown (catabolism) in animals, this peculiar drug soon found its way into bodies of AIDS patients who desperately needed something to prevent their bodies from breaking down protein. Kynoselen is different than steroids and induces many very important physiological processes all bodybuilders love. Increased anabolism/anti-catabolism, increased ATP production and reduced body fat levels. Kynoselen is a very popular contest prep drug in France. Kynoselen is a vitamin/mineral supplement, not a testosterone related anabolic steroid like you might expect. Kynoselen is a new drug; and nobody has been able to precisely explain how it works. However, it's the belief by some in the scientific community that one of Kynoselen's key ingredients, adenosine monophosphate (AMP) is the main reason for its popularity with bodybuilders. They believe that AMP acts as a signaling compound that instructs the muscle cell to initiate protein synthesis. This makes a lot of sense because increased AMP levels have been shown to dramatically increase a master enzyme that controls virtually all cellular activity. Some bodybuilders are using Kynoselen for site injections, similar to synthol site injections. But generally most do subcutaneus injection (under the skin, like an insulin injection). The general "gym doseage" is about 1 ml per day for a 200 lb. bodybuilder. Provides... cellular, muscular and metabolic stimulation. Provides... cellular energy and helps with energy conversion. Helps... regulate and protect cardio-vascular function. Helps... treat and prevent myopathic diseases. 200mg - this `active' form of phosphorous stimulates energy transformation, provides an immediate source of cellular energy, and helps cardio-vascular regulation. HEPTAMINOL 500mg - a psychostimulant and cardio-respiratory stimulant. Helps dilates coronary blood vessels. VITAMIN B12 25mg - stimulates general metabolism and supplements when Vitamin B12 levels may be low. SODIUM SELENITE 50mg (23mg elemental selenium) - selenium is a catalyst for energy and fat metabolism, an anti-oxidant and regulator of metabolic oxidative processes, and an essential trace element. POTASSIUM ASPARTATE (1000mg) - the aspartate salts stimulate the Krebs and urea cycles, assist glucose/glycogen metabolism, help protect the heart when oxygen deficiency occurs during strenuous exercise, and help increase the amplitude of its contractions. KYNOSELEN is valuable whenever cardiac or skeletal muscles are compromised or damaged through disease, deficiencies, or over-exertion, and when a general restorative, stimulatory or `tonic' effect is desired. Helpful where there is debility and loss of strength. * Myopathies and muscular degeneration in all species. * `White muscle' disease and other selenium deficiency myopathies. * Hypocalcaemic and hypomagnesaemic metabolic disease of cows. * Recumbent or `downer' cows. * `Tying-up' syndrome in horses. * After racing or strenuous exertion. * Cobalt and Vitamin B12 deficiences. * Muscular weakness secondary to arthopathies in dogs and cats. * Cardiac disease or degeneration. * Muscular disorders in pigs. * General debility and weakness. * As a general stimulant or restorative of metabolic processes. 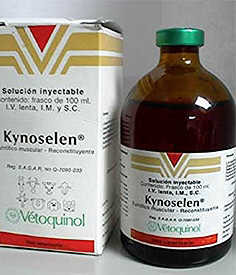 "When cellular energy is depleted or the body needs a `lift', KYNOSELEN helps heart and skeletal muscles to compensate". Administration may be by subcutaneous, intramuscular, or slow intravenous injection. Only subcutaneous injection is recommended for dogs and cats. Administer in the anterior half of the neck in food producing animals. The recommended dosage and frequency of administration is correlated to the selenium content of KYNOSELEN. When used as a treatment, it is recommended to give one injection every 3 days on 3 to 4 occasions. When used for preventative purposes, one injection may be given once weekly for 2-4 weeks. It is advised to withhold from racehorses at least 24 hours before racing. By the intravenous route, the LD50 in mice is 8.5ml/kg. No adverse affects have been reported at recommended dose rates. Licensed under the Animals Remedies Act 1967, No. 4234. Prescription Animal Remedy (P.A.R) Class 1, for use only following a veterinary consultation. Secrets is the only steroid-shopping guide you’ll ever need! Find anything you want to achieve the ideal physique, saving money and not getting caught!